After Venice we went to Red Lobster. Don't ask me why, I can't remember. Get a load of the outside of the restaurant though. 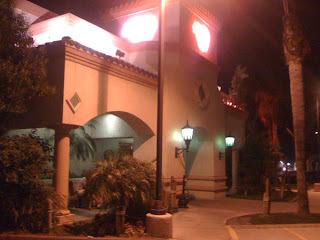 This looks like the outside of a fancy hotel, but in Oxnard, every store has spanish tiles, archways, and palm trees. I like that. Afterwards... We must have gotten drunk one last time in the jacuzzi, like every night.